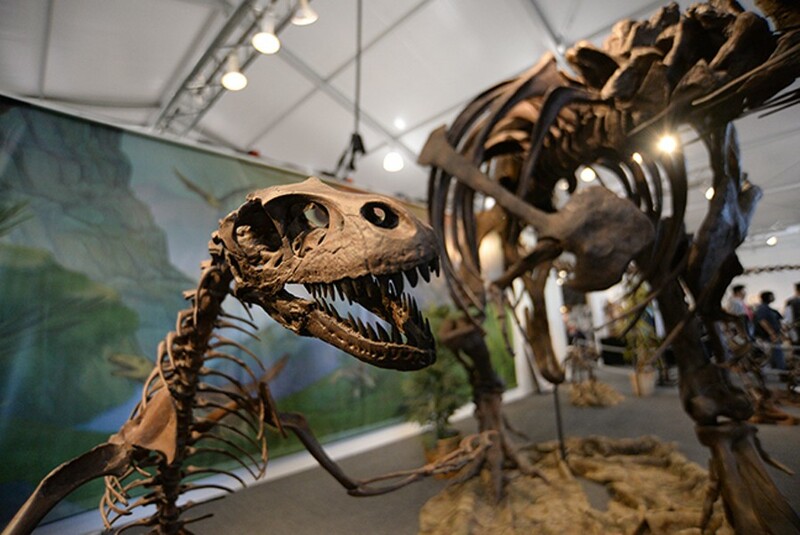 Courtesy The yearly bonanza that is Tucson’s collection of gem and mineral shows has grown from a school exhibition to a global tourism draw. What began as a small showcase at an elementary school now brings Tucson an estimated $120 million annually—but how? The Tucson Gem and Mineral Show celebrates its 65th anniversary this year, and with it, the City of Tucson expects over 60,000 visitors from out of town during its three weeks. "The scale of it is so significant for the city," said Dan Gibson, director of communications for Visit Tucson, "It's almost like Tucson's Super Bowl." Colloquially called "the gem show," also named the Tucson Gem, Mineral & Fossil Showcase, is much more than a single show. It's more of a gem season, now consisting of 48 different shows at dozens of locations around the Greater Tucson Area. "The scale's really been interesting," Gibson said. "Before working here, I just didn't have a sense of how much was part of the gem show." The Tucson Gem and Mineral Show started Saturday, March 19, 1955 as a small rocks show case at Helen Keeling Elementary School. Roughly 1,500 people attended that first year. For its second year, the gem show outgrew the elementary school, moving to a Quonset hut on the Pima County Fairgrounds. Over 3,000 visitors came the second year. At its more public location, the show gained more popularity and even included business sponsors. However, the Quonset hut was not secure, resulting in the event organizers taking night shifts protecting the hoards of gems, shotgun in hand. In 1972, the show moved to the newly-built Tucson Convention Center, where, at least partially, it has remained every year since. By '72, annual attendance passed 10,000 visitors. According to the book The World Came to Tucson by Tucson author Katherine Rambo, which documents the Tucson Gem and Mineral Show, "Old Tucson had created The Show. Now, The Show would help influence, define and reshape the new Tucson." Over its 65 years, the gem show grew to incorporate multiple venues, and multiple subjects, including: fossils, jewelry, Native American art, meteorites and glasswork. While every show provides opportunities to revel in the wondrous world of rocks, many include specialty events, such as the Mineral & Fossil Co-op Show, the Colors of the Stone show at Casino del Sol, and the Sonoran Glass Art Show. Meteorite specialist Geoff Notkin has attended the gem show for 22 consecutive years, and runs a booth for his company Aerolite Meteorites. Notkin says his two favorite exhibits are the Kino Gem Show at the Kino Sports Complex, and the 22nd Street Gem Show. "There's a remarkable ebb and flow to the gem show," Notkin said. "A venue that might be very popular might fade over the years, and a new one might come in... Often it's an adventurous feeling. You walk into a gigantic building with hundreds of vendors, but it's also being done in an open and friendly way. It brings together every stratum, from a chic diamond dealer to a scruffy prospector." The centerpiece of the gem show is the registered and trademarked "Tucson Gem and Mineral Show" presented by the Tucson Gem & Mineral Society. Branding itself as the "largest, oldest and most prestigious gem and mineral show in the world." Housed in the Tucson Convention Center, the show runs from Feb. 14 to 17, and goes far beyond selling stones. The Tucson Gem and Mineral Show invites approximately 3,000 Arizona students to attend for free, and educates with lectures and seminars, for both adults and children. "It's very inspiring when you consider that the gem show is a collective on two levels," Notkin said. "On the vendors' side, it's almost like an art collective. You see all these different natural works of art. It's like a museum of everything in the natural world. But more importantly, it's a collective on a global scale. Because from late January to mid February, Tucson becomes an international city." According to Notkin, one single gem show out of the total 48 reported hosting vendors from 26 different countries. Gibson has also seen the gem show's international reputation in his work with VisitTucson, when a French journalist he spoke with only knew of Tucson because of the gem show. "The economic impact from the show is really important, but it's really amazing because it puts Tucson on the map year-round," Gibson said. "People recognize there's something really, really important that happens here two weeks out of the year." As for the future of the gem show, Gibson says the City of Tucson is planning what to do with the show's continued expansion west, beyond I-10. He says there are also multiple vendors looking to set up permanent shops, rather than stopping by annually. "We work all year round getting ready for it," Gibson said. "It's definitely an undertaking, by all means." For a full gem show directory, head online to visittucson.org/visit/events/tucson-gem-mineral-fossil-showcase.